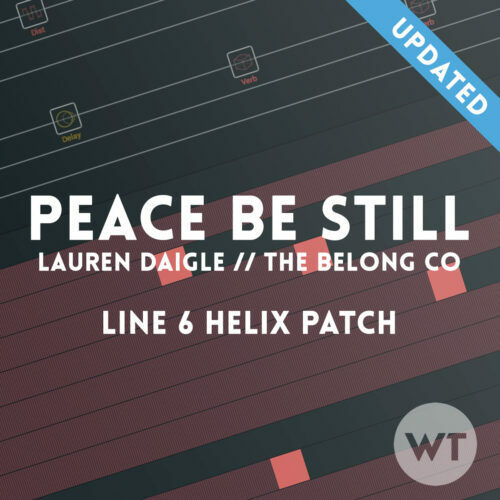 Line 6 Helix patch for the song Peace Be Still by The Belonging Co (Lauren Daigle) from the album ‘All The Earth’. Includes snapshots for the different sections of the song. You get two different patches – one using an IR Cab by LiveReadySound, and the other using stock cabs. The IR is not included. In this demo Bradford is using a MJT Thinline Tele with Porter Vintage Tele pickups. This demo was made with version 1.0 of this patch. Scroll down to the changelog to see how we’ve improved this patch. SNAPSHOT 1: INTRO/VS. This is the tone for the main riff in the intro and through the verses. SNAPSHOT 2: CHORUS 1. Clean-ish tone for the first chorus. SNAPSHOT 3: CH BIG. Big rhythm tone. SNAPSHOT 4: CH PUSH. This gives you a 2db volume boost for the lead lines in the big choruses. SNAPSHOT 5 SWELLS: Big ambient swells for the down section. SNAPSHOT 6: Bridge CLN. Clean tone for the first part of the bridge. SNAPSHOT 7: BRIDGE BLD. More drive for when the band kicks in.